Sweet Virginia is an odd title for a movie set in Alaska. An early version of this moody, atmospheric neo-noir thriller was located in the Appalachian Mountains; however, when director Jamie M. Dagg came on board, he moved the setting far to the north. 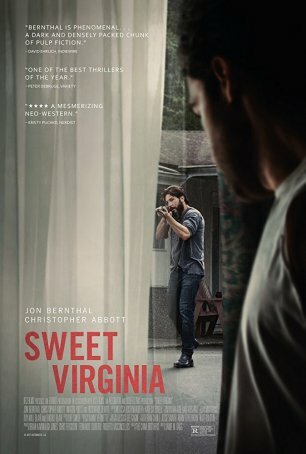 The title has survived because one of the film’s central locations, a motel, is named “Sweet Virginia” in honor of the state from which the lead character, ex-rodeo star Sam (Jon Bernthal) hails. The movie opens with a brutal prologue featuring a triple murder. The killer, a steely-eyed psychopath named Elwood (Christopher Abbott) has been hired by a young woman, Lila (Imogen Poots), to get rid of her husband. Elwood decides that it’s cleaner to remove witnesses, so he kills the two men accompanying his target. One of the dead men was married to Lila’s friend, Bernadette (Rosemary DeWitt). It wasn’t a happy marriage – she’s having an affair with motel owner Sam – and she’s not devastated by her loss. At one time, she confesses to not having cried and her husband’s murder doesn’t impede her sexual liaisons with Sam. Meanwhile, Elwood hangs around, waiting for Lila to collect her husband’s estate and pay him. During his sojourn, he rents a room at the motel and befriends Sam, whom he recognizes from his rodeo days. Problems arise when all Lila inherits are debts and she’s unable to compensate Elwood. As with most slow-burn neo-noir movies, Sweet Virginia thrives on atmosphere. It oozes it from every frame. The specific setting of Alaska isn’t relevant (in fact, the movie was filmed to the southeast in Canada for logistical and budgetary reasons) – any isolated community would have done – but cinematographer Jessica Lee Gagne captures the loneliness and emptiness of a location that might be difficult to find on all but the most comprehensive of maps. Director Jamie M. Dagg is a master of building suspense – even if the sequence doesn’t climax with a release of the tension. Case in point: a scene in which Lila is driving across town when she suspects she’s being followed. The camera mainly shows the view through the front windshield (occasionally cutting to Lila’s face). In the rearview mirror, we see the headlights of a car that appears to be tracking her. Then, as she approaches a railroad crossing, the gates come down and a train impedes her progress. As she sits trapped, the headlights move closer… There are three or four such moments during Sweet Virginia that keep the viewer on the edge of his/her seat. Jon Bernthal, Marvel’s The Punisher, is cast against type. Despite his reputation as a man of action, Bernthal dials things down to play Sam who, despite an impressive physique, has a long fuse and, if it comes to a physical confrontation, he is pretty much useless. Rosemary DeWitt’s Bernadette, however, is the opposite. Usually meek and unassuming, she is anything but laid-back if the situation demands it. As Elwood, Christopher Abbott (whose credits include indie movies and TV work) gives a creepy performance. With his dead eyes and awkward mannerisms, the only thing surprising about Elwood is that he’s accepting money for something he probably enjoys. Imogen Poots is solid but underused. Dagg understands the importance of a thriller not overstaying its welcome (especially one the relies not on action but on mood). With a svelte running time of about 90 minutes, this movie hits the sweet spot. It starts with a bang, ends with a bang, and those scenes bookend some solid character moments and tense, atmospheric filmmaking. This small gem is worth seeking out.